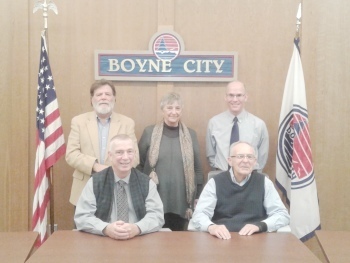 The Boyne City Commission is made up of five elected officials; Mayor, Mayor Pro-tem and three Commissioners. Commissioners are elected by its' citizens during the November elections for a term of four years. The commission shall constitute the legislative and governing body of the city and shall have power and authority, except as otherwise provided by Charter or by statute, to exercise all powers conferred upon or possessed by the city, and shall have the power and authority to adopt such laws, ordinances and resolutions as it shall deem proper in the exercise thereof. Mission Statement: The people of Boyne City are the reason we are here; We are therefore committed to working with the community to provide ethical and responsible local government so everyone can enjoy the benefits of living and working in Boyne City.